Secretary of State Kerry, who voted for George W. Bush’s Iraq invasion in 2003 and wanted to bomb Syria last year, and President Obama, who’s crossed borders regularly to kill enemies, are outraged that Russia has intervened in Ukraine, a case of double-talk and double-think, says Norman Solomon. Today, Uncle Sam continues to preen as the globe’s big sheriff on the side of international law even while functioning as the world’s biggest outlaw. Rather than striving for an evenhanded assessment of how “international law” has become so much coin of the hypocrisy realm, mainline U.S. media are now transfixed with Kremlin villainy. This must be an old file photo of John Kerry. 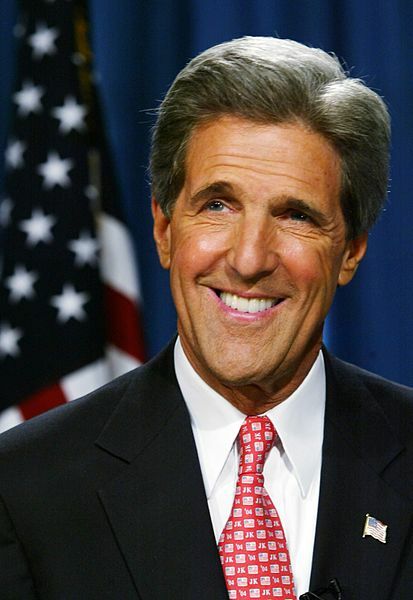 I saw that TV clip of Kerry’s “Guinness Book of World Records” attempt at straight-faced diplomatic hypocrisy. “You just don’t in the 21st century behave in the 19th century fashion by invading another country on completely trumped up charges”. The President picks up the phone and says, “Put a call through to the Surgeon General, and tell him to get in touch with Joan Rivers’ doctorâ€¦that’s right, the same one who embalmed Nancy Reaganâ€¦yesâ€¦yes, It’s a national emergency. He’ll know what it’s about”. Switch to that film noir scene from the Humphrey Bogart movie, “Dark Passage”, where craggy-faced Houseley Stevenson plays Dr. Coley, the straight-razor wielding plastic surgeon who’s had, “a few problems with the medical association”. Everything is shot from “point of view” camera angles to enhance the suspense. Tyahnybok is an anti-Semite who says â€œorganized Jewryâ€ controls the Ukraineâ€™s media and government, and is planning â€œgenocideâ€ against Christians. He has turned Svoboda into the fourth largest party in the country, and, this past December, U.S. Senator John McCain shared a platform and an embrace with Tyahnybok at a rally in Kiev. So McCain after embracing Tyahnybok in December today addresses AIPAC condemning Obama’s weakness…. is this double speak?